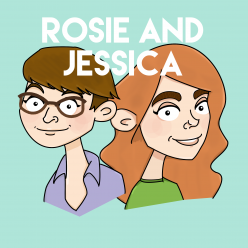 In episode 49, Rosie and Jessica regale us with tales of their literal day of fun together, while Jessica has not only watched the Super Bowl, but aged another year as well. The Top 5s take a soup-y turn and Rosie can finally reveal her mystery knitting from the last episode. This episode was produced by Interns Kaley and Walter. Jessica brought us Meatloaf’s I’d Do Anything For Love (But I Won’t Do That) while Rosie is tucked up in bed with Kimya Dawson’s So Nice So Smart. Rosie visited The Story Museum in Oxford. Rosie has made a Basic Raglan Baby Cardigan Sweater. Are you ready for the new Decemberists album? Just imagine if Hermione were the main character in Harry Potter. How well do you know Romy and Michelle’s High School Reunion?